In an effort to try to keep blogging about Lilly's happenings in addition to Baby Baum 2.0's pregnancy, I have a mildly humiliating but pretty funny story to share with you all. My child is a parrot. She repeats EVERYTHING, to the point where I can't figure out when/where she heard things, and sometimes she won't repeat things until several days after she heard heard them, which makes determining when/where she heard them that much more difficult. It truly is incredible, if you think about it, but it also means we have to be very careful with how we choose our words. You have probably already figured out where this is going. I have been SO CAREFUL with my words. Language clean-up was probably something that needed to happen in our house anyway, but I want the record to show that I have been very diligent about thinking before I speak and not saying anything I wouldn't want my daughter to repeat at church school. Drop something? "Oh, goodness." Forget something? "Rats!" Dan, on the other hand, has had a slightly harder time adjusting. I just KNEW that Lilly was going to say her first curse word to her teacher at her (church) school on the first day. I was wrong on several counts. Last Tuesday, Carney arrived as usual and I was in the kitchen packing my lunch. Lilly was playing in her little kitchen in the den, and I heard her drop one of her little pots and say, "D@mnit!" Carney and I looked at each other and I said, "Did she say what I think she just said?" And Carney said, "It sure sounded like it." Then I said, "I'm not even sure where she would have heard that, Dan is out of town, maybe she is saying donut. Lilly, did you just say donut?" At which point, Lilly picked her pot up off of the floor, threw it towards the stairs, and again, said "D@mnit!" Great. Not only is she saying a curse word, but she is, of course, using it in the correct context (it's probably wrong that I was impressed by that fact). The first phase I went through was denial. Dan was out of town, which meant that L had to have heard it from me, but I've been so careful!!! Bo and Meagan were nice enough to invite us to dinner the night before since Dan wasn't here, and Meagan had to warn Bo to watch his mouth around Lilly, so I assumed it was something he said. In fact, when he dropped Kinsley off that morning, I asked if he'd said it. He said he hadn't, but I still just knew it had to be him. I called Dan on my way to work to tell him about the incident, and sure enough, as I was telling him, I remembered that it was me. I was devastated. Dan was gloating. I was trying a new recipe that morning and was looking for something in the kitchen when I dropped whatever was in my hand, and I said it, but it was under my breath and I still to this day cannot figure out how Lilly even heard it. Apparently her hearing is excellent unless I'm telling her "no" or something else that she elects not to hear. The thing that makes this the most funny is that we were going to meet Lilly's teacher the following day (she's starting a 3-half-day-a-week program at a local church in a few weeks). I really did NOT want her saying that word (correct context or not) in front of her teacher/other parents/new classmates. Oy. Lilly repeated the word (while throwing/"dropping" things) quite a few more times before I even left the house. I just kept ignoring it, because I knew that if I acknowledged it and told her not to say it, she would definitely keep repeating it. I sent Carney a text around 11:30 that day asking if Lilly had forgotten about it yet (to Carney's credit, she was doing a GREAT job of trying to distract Lilly. When L would say the word, Carney would come up with other words that started with "d" or sounded like that to distract her. "Did you just say donut/throw it/etc.?"). Side note: Lilly LOVES to sing "Elmo's song," but change the words. Mommy's song, Layla's song, elbow song, toothbrush song, etc. Carney's response to my question was, "Well, she did, but she just now asked me to sing "d@mnit song"." Awesome. I guess they sang donut song instead. Luckily for all of us, Lilly seems to have forgotten the word...for now. Let's hope I don't get a report from her teacher on the first day that she was cursing. This has to be some kind of record for the youngest curse word. Be warned parents: they hear everything they aren't supposed to! Hope everyone is having a great week! I am trying to play catch-up with current pregnancy updates - we're going on vacation this week so I've scheduled a post for every day. Shocking, I know. I'll leave you with a photo of Lilly testing out her new bookbag for school in the store. 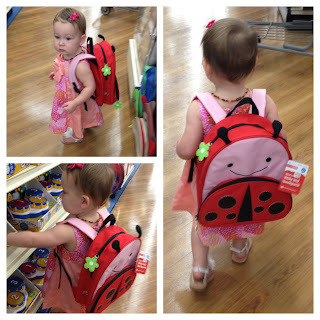 I am DYING over it, and she thinks she's such a big girl! I'm having it monogrammed as we speak (which I'm sure surprises no one), and then she will be ready to go. Who is this big girl and where did my baby go?